A special thanks to Rich Campbell for suggesting this post. To get a better sense of the history of the Pakistani flag, we should begin with the colonization of the Indian subcontinent by the British East-India Company (BEIC). While the organization had a presence in the area since 1612, the BEIC didn’t establish a firm foothold in the subcontinent until the mid 1700s. From then, the BEIC continued expanding its control for nearly a century. Their rule eventually encompassed modern India, Pakistan, Myanmar, and Bangladesh. Tensions came to a head during the Great Uprising of 1857, a rebellion by the natives of the subcontinent against British rule. Unfortunately for the natives, the rebellion only made the British reorganize and strengthen their armies and governance of the area. Many of the people involved in the rebellion were Muslim, so the British-influenced rulers removed the vast majority of Muslims from the Indian armies and replaced them with Sikhs. This, combined with other factors such as the Hindu Renaissance and language differences between the Hindus and Muslims of the area caused a cultural and ideological rift between the populations of Hindus and Muslims in British India. In 1906, area Muslims formed the All-India Muslim League to rally Muslims toward the creation of their own nation-state. A flag was created for the All-India Muslim League; a star and crescent moon on a green field. While I have already explained the importance of green in Islam, the crescent hasn’t always been associated with Islam. Some of the first recorded uses of the crescent come from the 2nd millennium B.C. where it represented the Mesopotamian moon gods Nanna and Sumer. Phoenicians spread the symbol throughout the Middle East and Northern Africa during the 8th century B.C. As these nations converted to Islam, the symbol stayed with them. The Turks began adding a star to the crescent in 12th century A.D. due to the importance of stars in the 53rd surah (chapter) of the Koran. With the fall of the Ottoman Empire in the early 20th century A.D., Turkey was left as the lone Muslim world power, further popularizing the use of both the crescent and star as a symbol of Islam. As modern Islamic states and movements began forming throughout the 20th century, they turned to the Turkish flag for inspiration. Violence between Hindus and Muslims escalated throughout the first half of the 20th century. Hope for a resolution came after World War II. Weary and rebuilding, Britain began realizing that it no longer had the power to rule over the Indian subcontinent. Just one day apart in November of 1947, Muslims and Hindus formed their own separate countries; Pakistan and India. 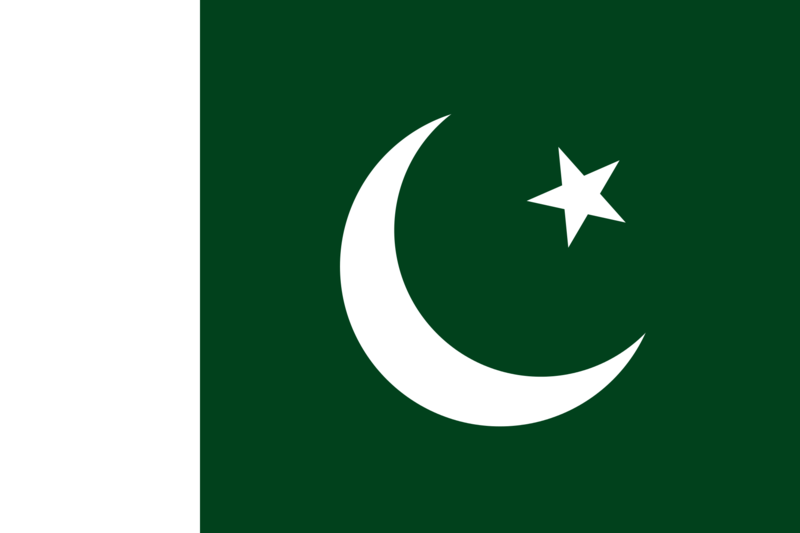 Amiruddin Kidwai, a Muslim activist, is credited with the design of Pakistan’s flag. It is heavily based off of the All-India Muslim League flag, fully encompassing the political group’s original flag design. The green field represents Islam while the star and crescent moon represent light and progress, respectively. The only addition to the All-India Muslim League flag is a white rectangle near the hoist which represents religious minorities and their rights within Pakistan.